The most crucial and important thing in your computer that you don’t want to lose ever is the data stored in it. Hardware can be replaced if it breaks down, softwares and applications can be reinstalled if they crash but if proper measures are not being taken for data security, chances are there that you might lose your valuable data protection forever. We all have different kind of data stored in our computers like personal and business related documents. Personal data protection comprises of pictures, videos, personal information and other stuff. At the same time, we have our business data stored in our computers as well that comprises of confidential files and folders that need to be secured and protected from others. So what can you do to ensure high level security for your data? Here, we present 5 useful tips that will help you greatly in protecting and securing your data from loss or unauthorized access. Data protection is not some rocket science or something for which you must need to be technically sound. Anyone can provide strong data protection by following the below presented some handy and useful tips. Your computer might be in access of multiple users, thus compromising your privacy and security. If that’s the case with you, then you must set up a separate user profile for yourself that is password protected. While doing this, you must ensure that all the files and folders you use must not be accessible by other users through their profiles. Always use the most recent and updated versions of all your softwares and anti viruses. This will eradicate the probabilities of your computer getting crashed due to outdated and virus infected apps and softwares that will ultimately lead to data loss. It happens quite often when a file containing crucial data is misused by some other person who somehow gets an access to it. Some applications like adobe reader and Microsoft office apps have a built in feature of password protection that once activated, gets locked. Similarly, there are many third party applications that are especially designed for the purpose of protecting other files and folders using a password. In this way, you can have your files secured from unauthorized access and misuse. The most important step one should take data protection to create a back up of it. It depends on you, how often you feel like backing up your files and folders. It may be on an hourly, daily or weekly basis or some prefer doing it manually whenever they feel the need arises. The backed up data protection is the copy of the original data stored in your hard disk drive. This data can be recovered from the hard drive if it gets crashed and you lose your entire data. Therefore, it is highly recommended that you always create a backup on your hard drive. But what if a fire breaks out and all your computers and storage drives gets destroyed? Then there is an option of creating an off-site backup of your data. There are various online backup solutions providers available in the market offering different features and pricing plans. You can choose any of them as per your need. Here you can find a list of some renowned online backup services with their features highlighted. 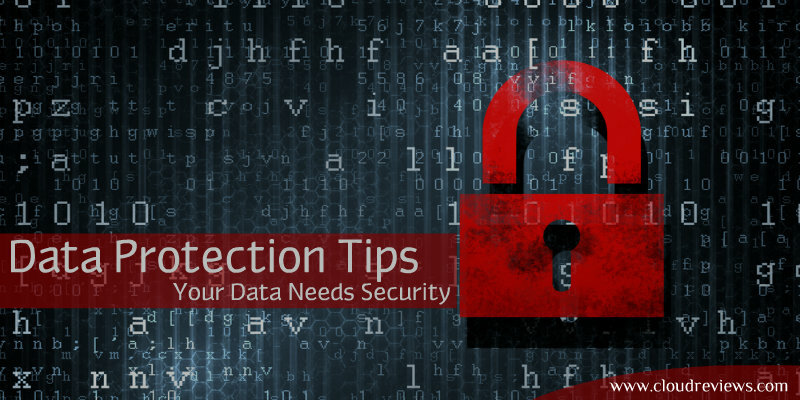 If you don’t feel like taking multiple measures for the security of your data, then we advise you to only follow the last tip suggested above. That would be enough to ensure a secure recovery of your data in case you lose it. Now we hope that you don’t need to be worried about losing your data anymore with these tips. Enjoy your life and store as much data as you want. No need to worry at all. Literally! !